THE UPC lobby has been relatively quiet, knowing that Germany put the whole thing on the ice if not in the bin. It may take several years for Team UPC to even know the outcome. We illustrate how publicly sanctioned IP valuation guidelines prevailing in Europe can be applied to assess damages as foreseen under the provisions of the UPC Agreement. With the help of a hypothetical example, we then evaluate if and to what extent the various ways proposed by European institutions to value IP fit with the provisions of the UPCA. We find that in situations where courts have all the necessary information required to determine damages, the IP valuation methods are a very useful tool in determining damages. It can however be expensive to obtain the necessary data to adequately determine damages. This article is a review of a report titled ‘Patents and Clean Energy Technologies: Bridging the Gap between Evidence and Policy’, published in 2010 by the European Patent Office and the International Centre for Trade and Sustainable Development. Either way, UPC lobbying can be seen elsewhere. “Both the UPC’s Court of Appeal and Registry will be in Luxembourg,” Bristows’ Brian Cordery wrote a couple of days ago. No, there’s no “will” (at best “would”) because there’s no UPC, but Team UPC does not care about facts and truths. A “unitary” patent system would mean more lawsuits, hence more money for such litigators. They just keep pushing fake predictions to mislead clients and politicians, hoping that they would ratify things hastily, in a great rush, even recklessly. 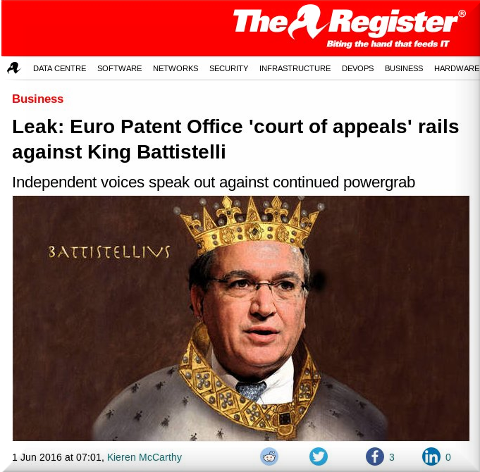 “They just try to give the public or the “users” the mere impression that they get to decide.”What about the EPO itself? Well, yesterday (for the second time in a week) it said: “Our online consultation on the proposed revised Rules of Procedure of the Boards of Appeal will close on 30 April. To take part go to http://bit.ly/2nDHz6V” (that’s the direct link, but be aware that it’s an epo.org link).